D.M. was kind enough to join the hype-cycle for my new book, which will soon be followed on by a published version of the “John Boyd Roundtable,” edited by Mark Safranski of ZenPundit fame. 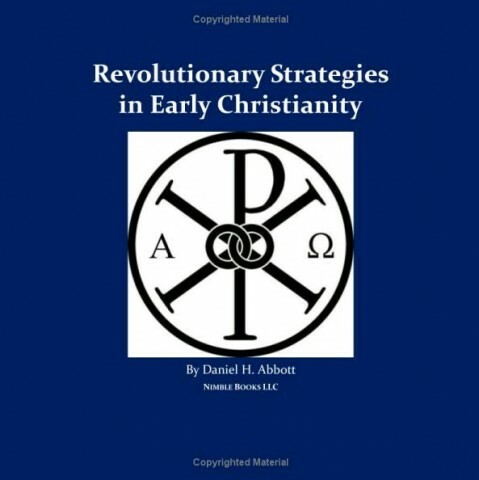 I wrote Revolutionary Strategies in Early Christianity: 4th Generation Warfare (4GW) Against the Roman Empire, and the Counterinsurgency (COIN) Campaign to Save It to help explain the persecution experienced by the early Christians in light of strategic theory. I believe that Romans, who martyred so many Christians, were not foolish or stupid. I think they knew what they were doing: they understood that if the Christianity triumphed, the world they knew and loved would be turned upside down. The Romans acted according to the same basic rules that guided the Nazi fight against la RÃ©sistance in France… and the American fight against al Qaeda in Iraq. I hope my book will be useful to those who want to begin learning about modern strategy, and for people who wish to know a little more about the rise of Christianity. From Joseph Caiaphas to the Prophet Muhammed, I describe the early enemies of Christianity as wise fighters who used strategies that now have buzzwords for names (COIN, xGW, and so on), but whose use goes back to the dawn of time. Damn son! Congratulations on the publication. Congratulations! I’m off to amazon.com to purchase shortly. Impressed I am! Good you do! Does this mean the Nazis seen the Jews of Europe as the same kind of threat as the Romans seen the Christians or we see AQ? If so, what was the actual threat? In what way would the Jews “turn National Socialist Germany upside down?” Since the Christians were spreading Christian ideology, what kind of ideology were the Jews of Europe spreading? Or maybe I should just read the book? Ah, now I know what to spend part of my rebate deposit on.